We are loving Angola – incredible scenery, friendly happy people, but the poorest people here are so poor it’s hearbreaking. We went past a school a few days ago on our way back from the Giant Baobab Tree to the main road. 6 classes of primary-school aged kids, tiny shed within the school grounds, each class of 20-30+ kids sitting under a different tree in the yard with teacher and blackboard at the front of the class. 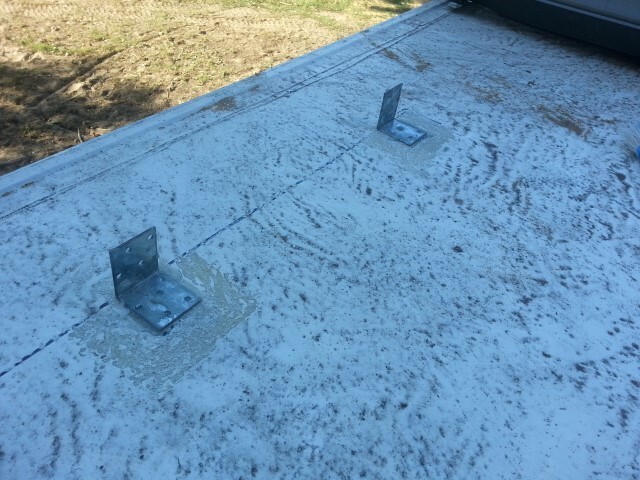 I guess the shed is to store the blackboards. It doesn’t rain much here, but I wonder what the classes do when it rains. Lots of people carry water from rivers, dams or water tanks back to their village. 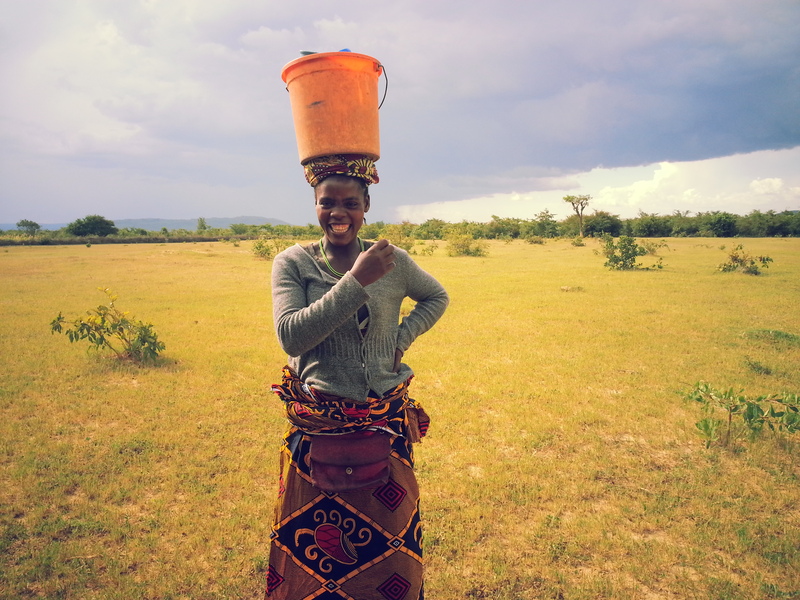 The water containers they use are mostly open containers that look like they were originally 20L paint buckets or similar, which the women carry on their heads. Little children carry 5L containers. 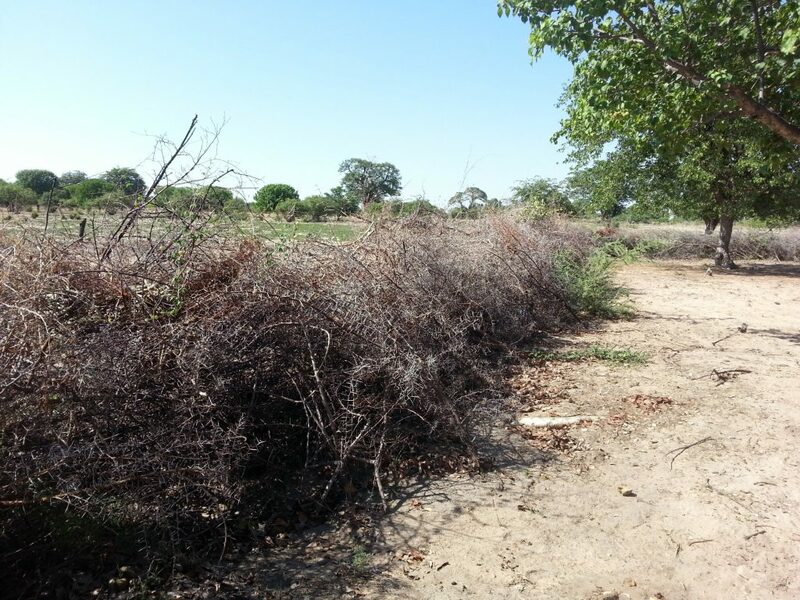 There is no running water, power or sanitation in villages away from towns. Of all the ‘stuff’ we have with us, the one thing that would immediately improve their lives is our 25L water drum with its nice tap in the cap … I wish we’d brought more water drums to give away. Lots of people ask us for money or food. I don’t give money, but do give away food and water. 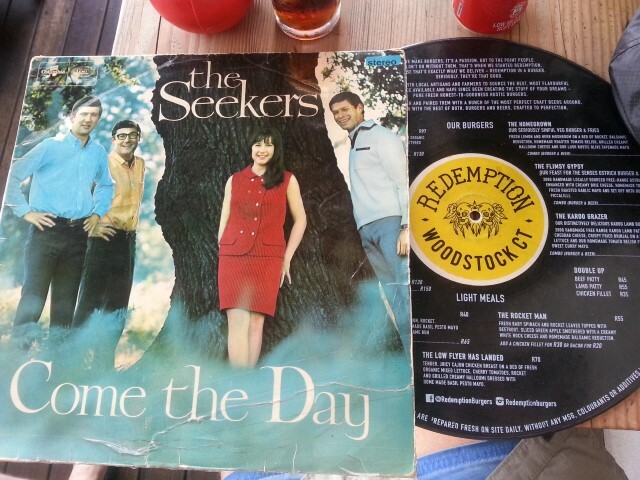 I’ve written about this before. I’m suffering from a lot of 1st World Guilt at the moment – we have so much, they have so little. One young woman spotted our 25 litre water container and really, really wanted it, but settled for a bottle of cold water in exchange for letting me take her photo. 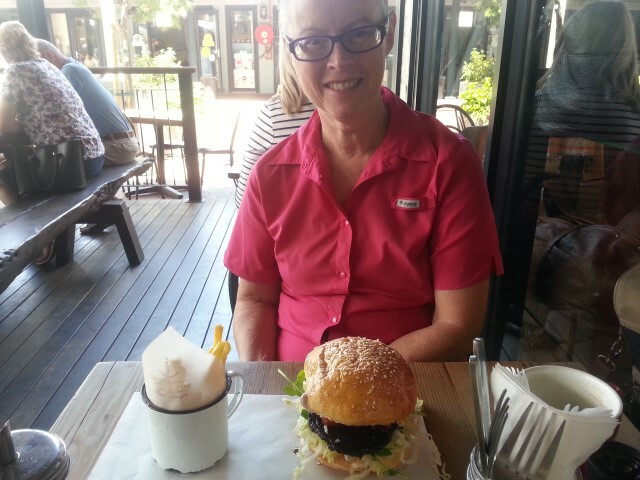 Food here is expensive compared with Sth Africa and Namibia because most of it is imported. 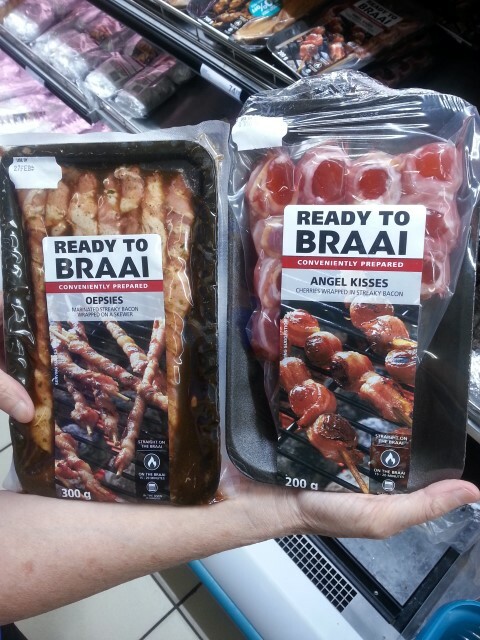 I saw frozen chicken breasts in the Shoprite supermarket in Lubango … from Brazil. 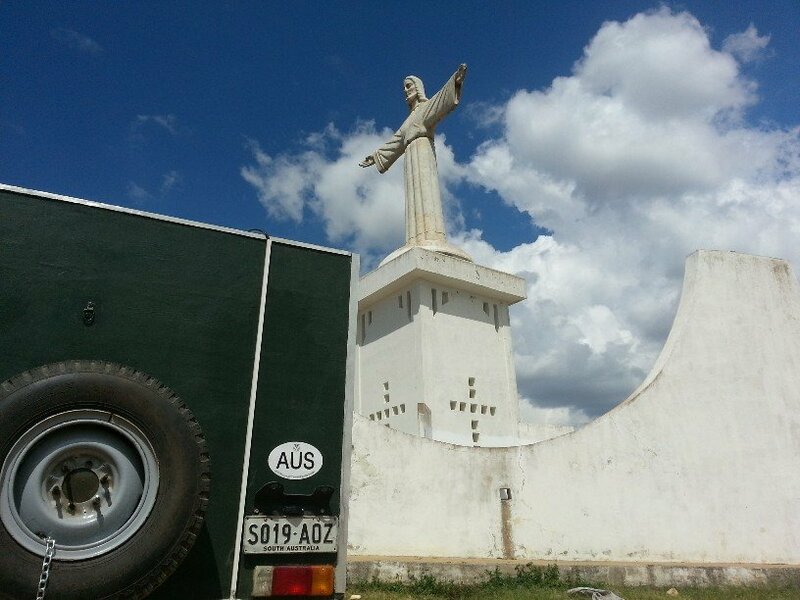 In Lubango there’s a smaller replica of the statue of Christ the Redeemer in Brazil, perched on the highest part of the city, over 2000 metres above sea level. This statue of Cristo Rei Christ the King has several bullet holes in his chest. 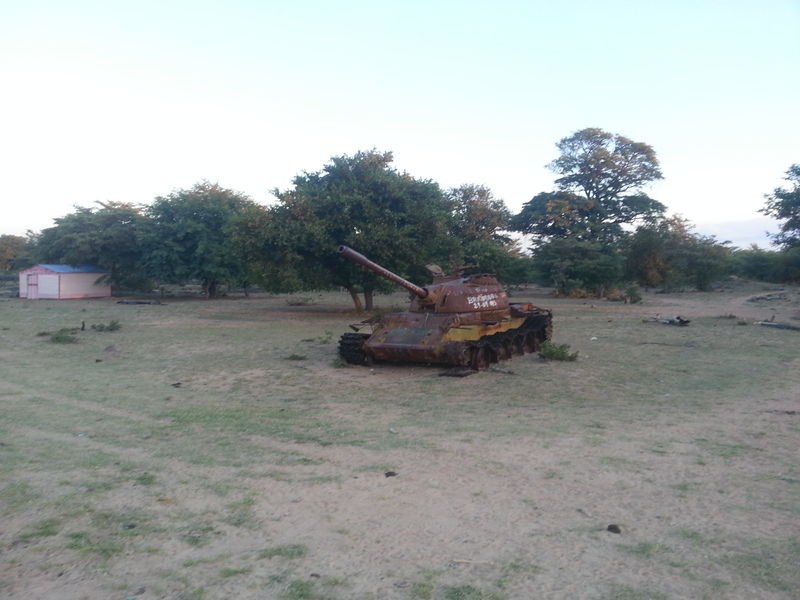 We drove to it and were the only people there, apart from 2 local men and a group of about a dozen pre-teenage Mwila girls in traditional dress. 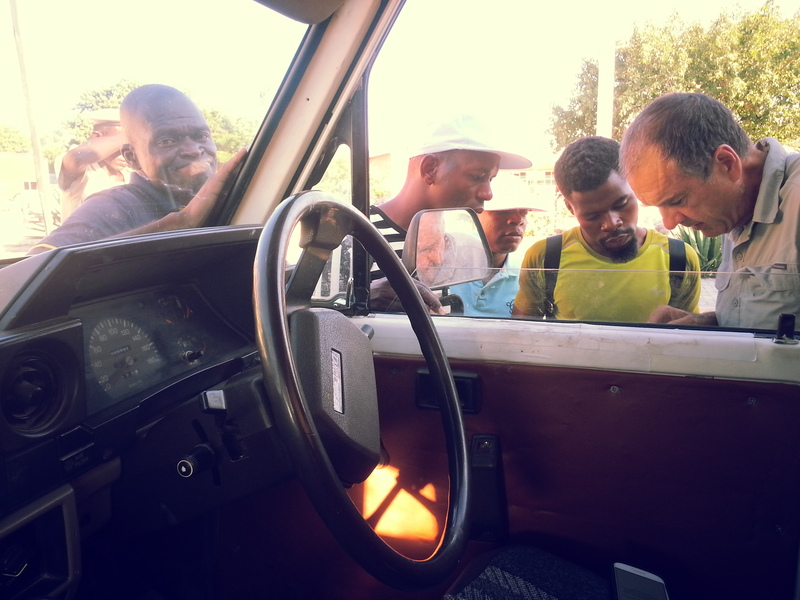 Several girls came to either side of the car and asked for money or offered themselves to Greg. On my side, one of them spent the whole time looking at herself in the side mirror which was the only appropriate behaviour we observed there. It was pitiful. The really sad part is that this country is the 2nd largest oil producer in Africa, so there’s a lot of wealth here, but it’s not trickling down to the ones who need it the most. In contrast, Norway’s management of it’s oil wealth has set their economy up so that everyone has a good standard of living. We’ve driven through several police road blocks each day. Most either wave us on or stop us and ask to see Greg’s driver’s licence and maybe the car’s papers. Then there was that time just after we left the Giant Baobab Tree when we drove through a roundabout … well, not quite the wrong way, but we went down a part that was meant for vehicles turning right and we were going straight ahead. Of course there were no road markings or signs because … #africa. So, 50 metres down the road there was a police roadblock and a very cross cop stopped us, asked for papers and got out his receipt book while explaining what we’d done wrong. Greg was escorted into the police building conveniently located right beside the road block. Cop flicked through his receipt book which was full, but the message was clear. Cough up, buddy. Greg came back and we thought that 2000akz $10 might be appropriate. We didn’t want to insult him by offering too little, but how much is too much? Turns out that 2000kwz was very generous, but we’ve written it off as ‘research’, and unlike the ‘speeding’ incident in Namibia, this time we really had done the wrong thing, so a fine was in order. 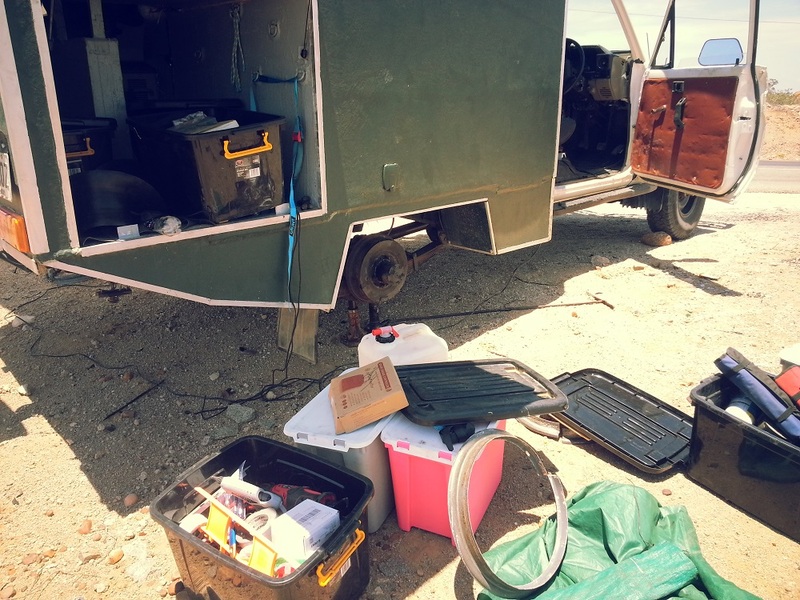 Throughout our travels, tyre problems have been an intermittent but irritating companion. Something to do with the places we go to and the ways we get there, I guess. We’ve also returned a few rental cars with their batteries in much worse condition than when we first got them, but that’s another story for another time. In mid-2001, 6 months after we met, Greg and I took a tandem bike to Viet Nam, back in the day when there was one ATM in Hanoi and one KFC in Saigon. We planned to ride from Hanoi to Sapa, but that plan came badly undone when we wrecked the inner tubes we’d brought with us and had loads of trouble finding replacements. 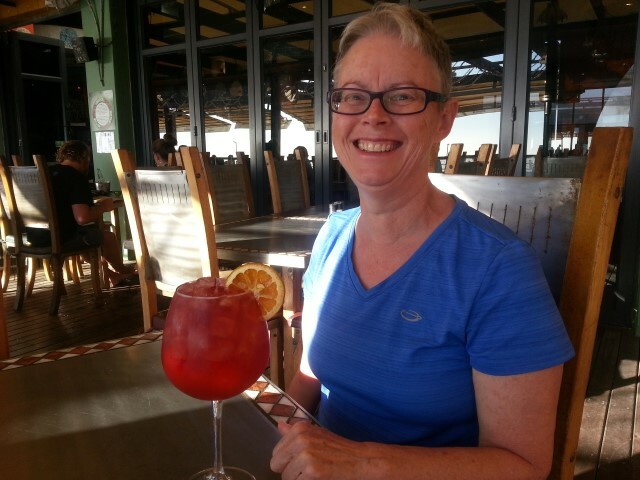 Despite that, we had a great trip and … well, we’re still together 18 years later, and still travelling in unorthodox ways to off-the-beaten-track places. 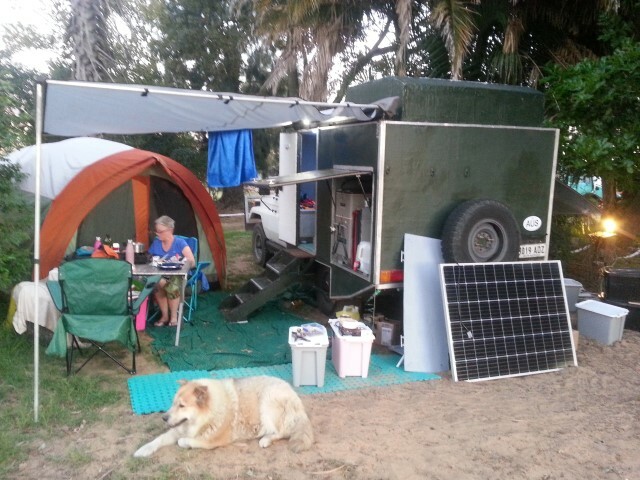 Then there was the time a couple of years later when we drove to Broome via the Tanami Desert with our kids, Greg’s parents and his niece. 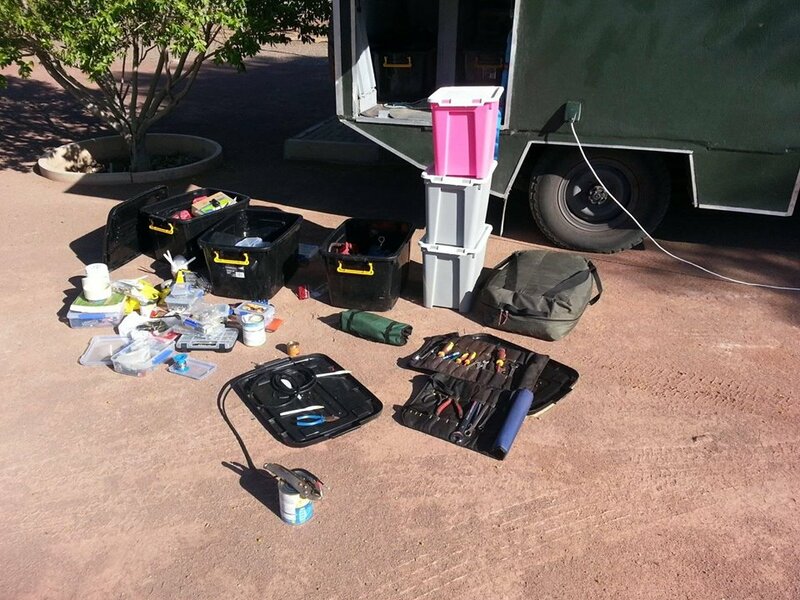 We had so much trouble with tyres on the Tanami that I bought a new set at Hall’s Creek. 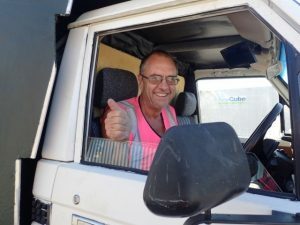 They were eye-wateringly expensive but worth it – it was a great trip and when I remember the trip, the last thing I think of is the cost of those tyres which ended up lasting a long time and took us on other camping trips within Australia – Simpson Desert, Innamincka, across the Nullarbor to Esperance & Israelite Bay. And then more recently there was the Swedish rental car that got a hole in a sidewall of a tyre in Oslo and we just couldn’t find a replacement, so Avis replaced the whole car for us. 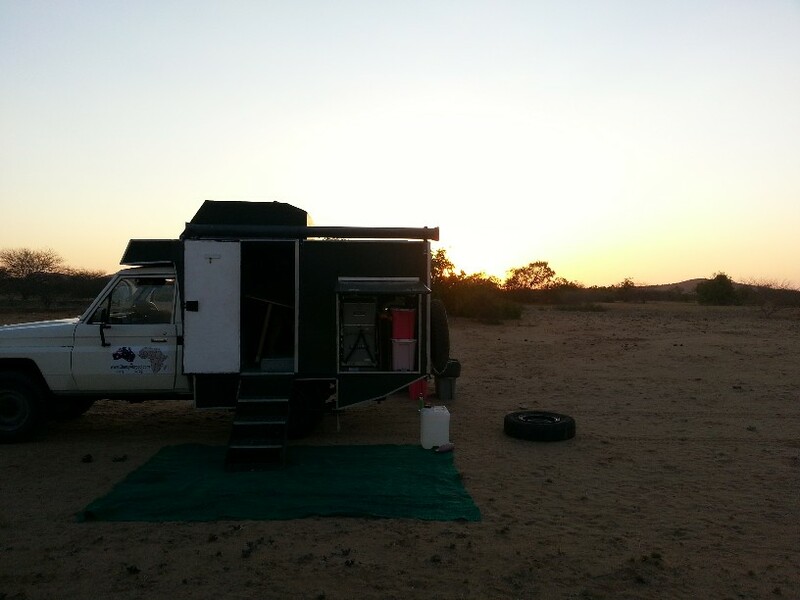 And the time we ‘did’ 2 tyres within 24 hours in Namibia. Which brings us to our latest adventure. 4 punctures and 2 blowouts. I’m not even going to add ‘so far’, because I think that’s quite enough. 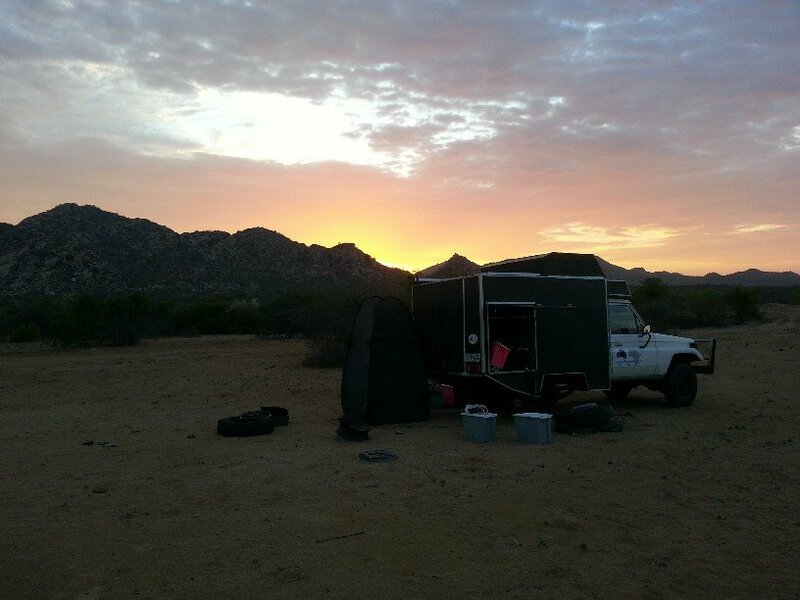 We’ve had to spend a couple of nights pretty much camping wherever we could find to stop because of a puncture. Always in the right rear tyre. We’re using spilt rims and the tyres themselves are all good, it’s the inner tubes that are our problem. Yesterday was a really trying day. We ended up on the side of the road to Namibe, a sort-of resort town on the west coast, about 10 kms south of where we’d camped the previous night, with our 2nd blown inner tube of the trip and rapidly dwindling options. It happened on a stretch of road where there was barely enough space to pull off, but thank heavens it WAS the right tyre in this country where they drive on the right side of the road. Changing a tyre right beside traffic wizzing past would be deathly. Part our emergency kit is 2 hazard triangles and I put them out about 50m on either side of Clancy, to warn oncoming traffic. Trucks were decent and slowed down & drove on the other side of the road, most cars didn’t even adjust their speed although a couple did stop and offer to help. 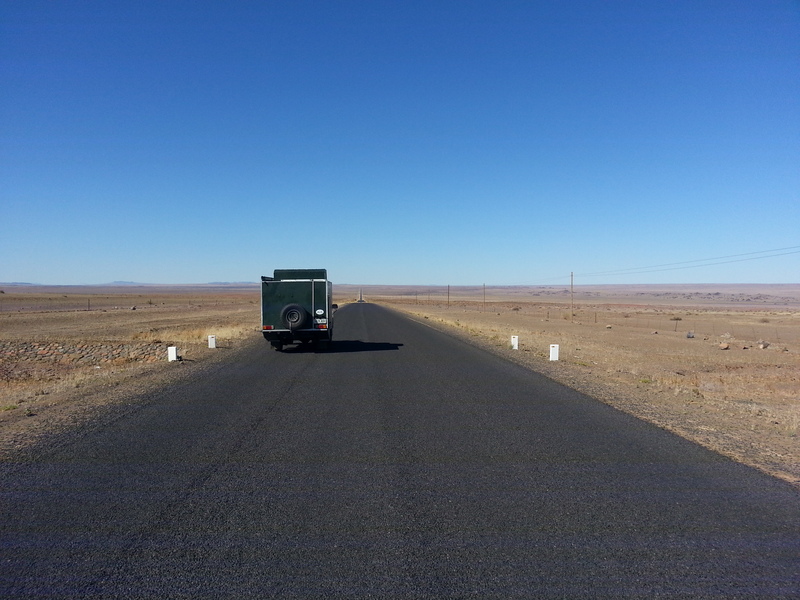 A tow truck drove the 50kms out from Namibe to see if we needed his services but we declined with thanks. At that stage we still only had 3 wheels on Clancy, so getting him on the back of the truck would have been tricky. We think someone must have just sent him out ‘on spec’. We do have 2 spares, but by then we were down to: 2 wrecked inner tubes, one that had been patched and 3 remaining decent tyres. 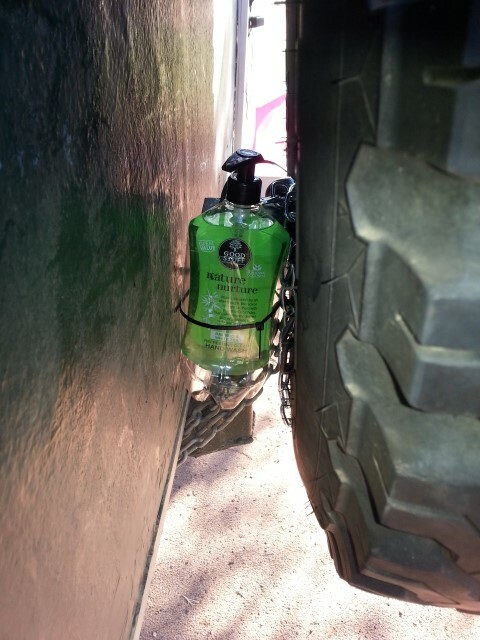 So Greg hopped online and found a really good piece of advice on the Beadell Tours page which suggested using talcum powder between the inner tube and the tyre to stop friction. We have talcum powder because Greg uses it when he makes fibreglass. Definitely worth a try. 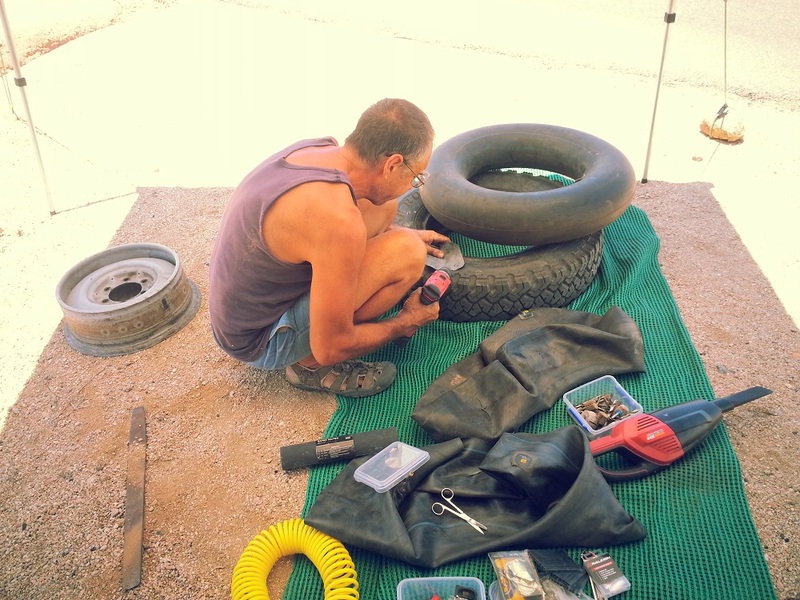 So, we limped into Namibe doing 40km/hr and with me watching the Tyredog tyre pressure monitor the whole time. Then how do find a tyre place? We drove around a few streets in the centre of town without success, then Greg had the excellent idea of asking a policeman. There were a few gathered around a modest building which turned out to be the police station. One of them in plain clothes offered to go with Greg to show him where to go, while I waited inside the station. First place had none, but recommended another place where Greg bought the shop’s entire stock of 2 inner tubes. Greg fixing inner tubes by the side of the road. He tried using a patch from a burst tube … unsuccessfully. Note the rock in the top rhs of the pic, holding the guy rope of the shelter in place. 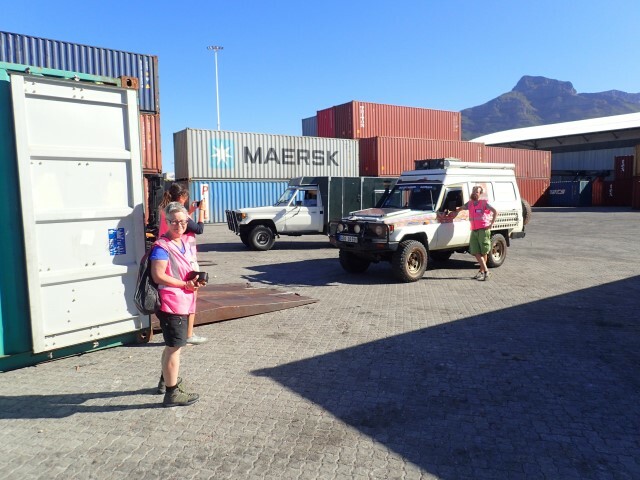 Judy negotiating to get our Jerry cans filled at the Puma station. 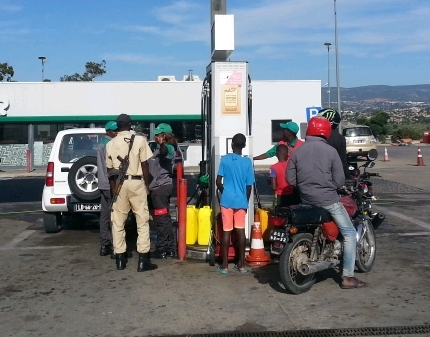 Note the Armed guard carrying an AK-47. There were 2 armed guards at all the Puma stations we visited. They were friendly and polite. 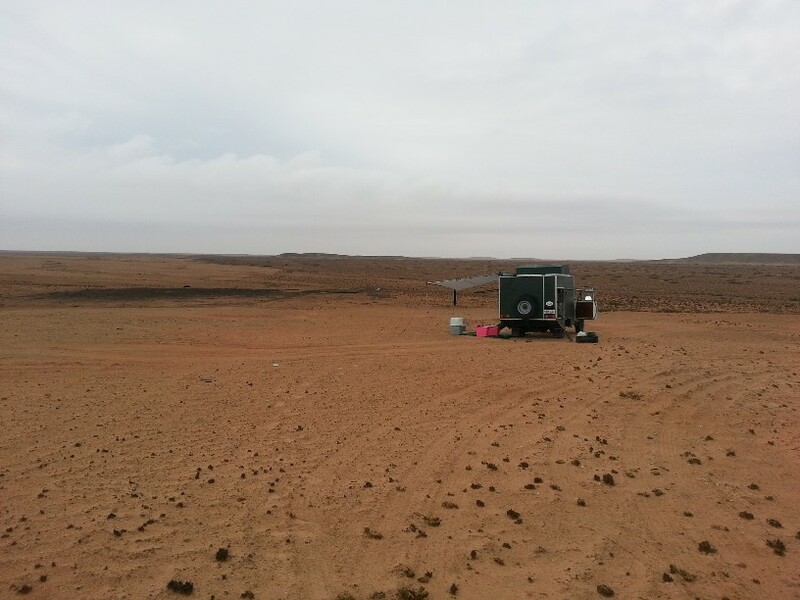 Camped again in the Naimbe desert 15km south-west of Naimbe. Oh. My. God. We’re in Angola! It took us 4 hours to get through Immigration and Customs yesterday, I’ll write more about that when our internet access is better, but to be honest, I didn’t even think we’d have internet access here, other than in large towns. 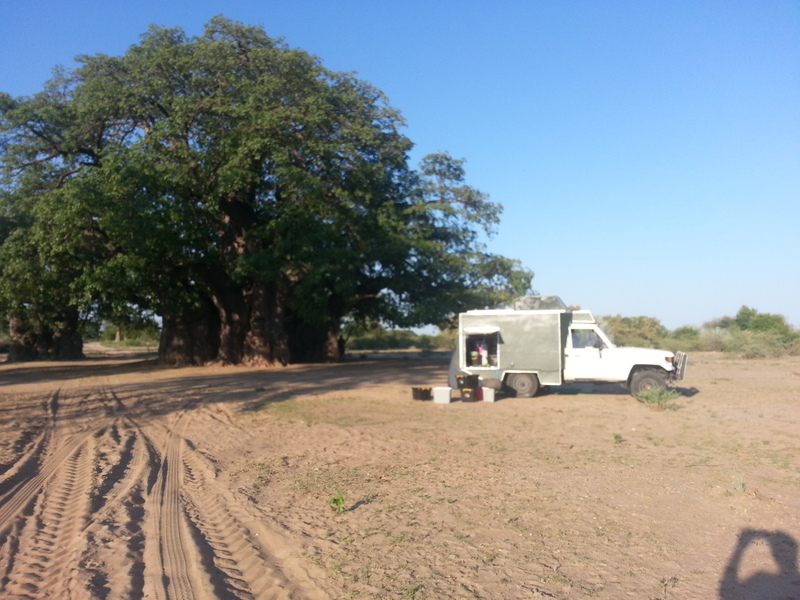 We spent last night camped near a huge baobab tree near Xangongo, about 130kms from the border. It’s reputed to be the largest baobab in Africa. We met a young Frenchman today and spent a couple of hours chatting with him (Hi, Joffrey!) and we’re staying here again tonight because it’s a nice place and we’re all set up and comfortable. 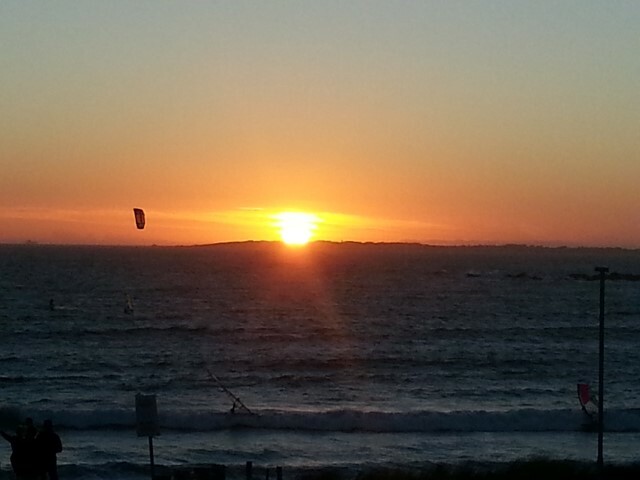 We’ve said bom dia good morning and boa tarde good afternoon to visitors and locals. The locals walk near where we’re camped to go and get water to take back to their village. The visitors, including a local policeman who was born near here. come to see the tree. 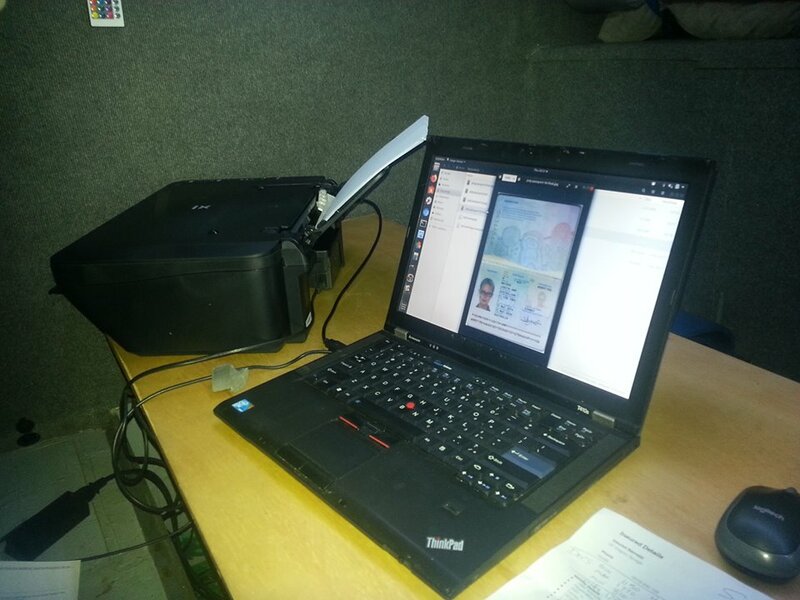 We now have our e-visas for Angola, thanks to a lot of hard work on Greg’s part – scanning, applying online and emailing. The process was (fairly) straightforward, but there were a few hoops to jump through, in terms of getting the scan sizes right. Lonely Planet’s Thorntree forum has a very helpful thread/post on how to do it. 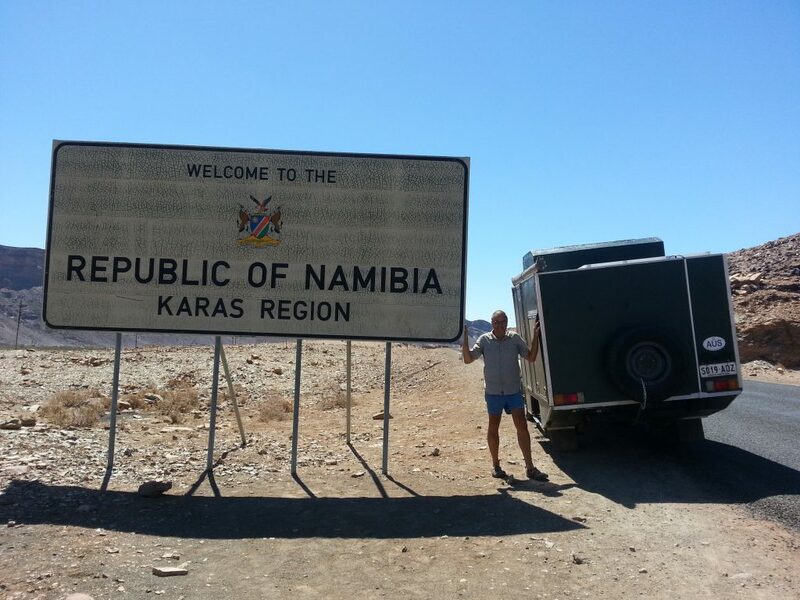 So, we are now committed to crossing the Namibian/Angola border at Oshikango/Santa Clara on Saturday. 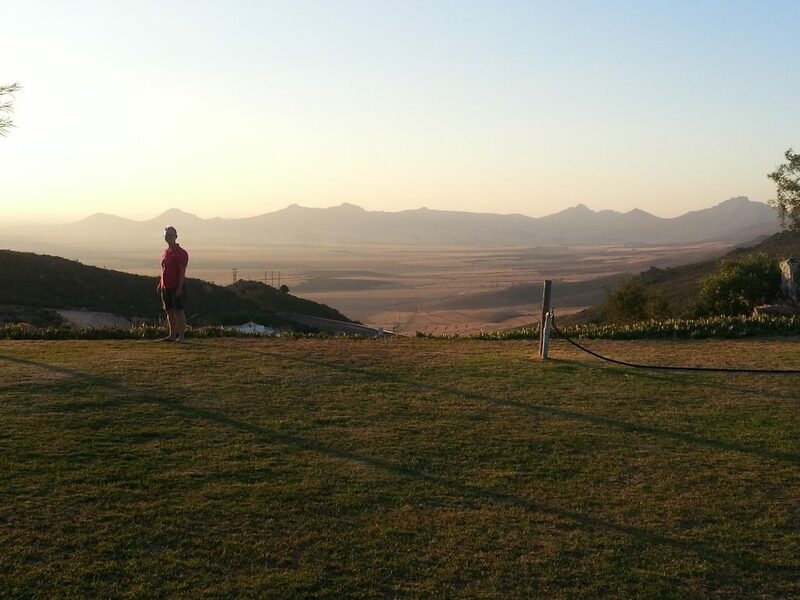 Distance from Windhoek to the border is around 750kms, which is 2 days driving for us. 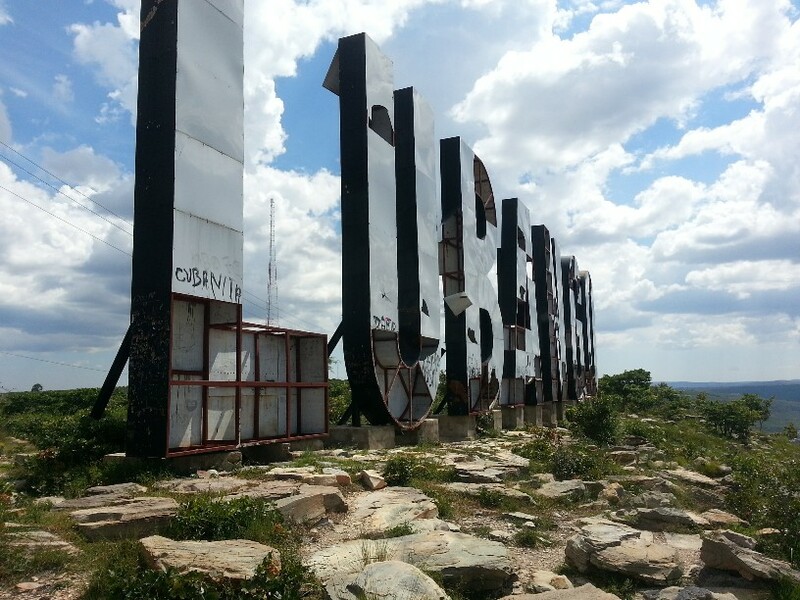 We did 420kms to Tsumeb yesterday, so we’ll have a shorter drive today. 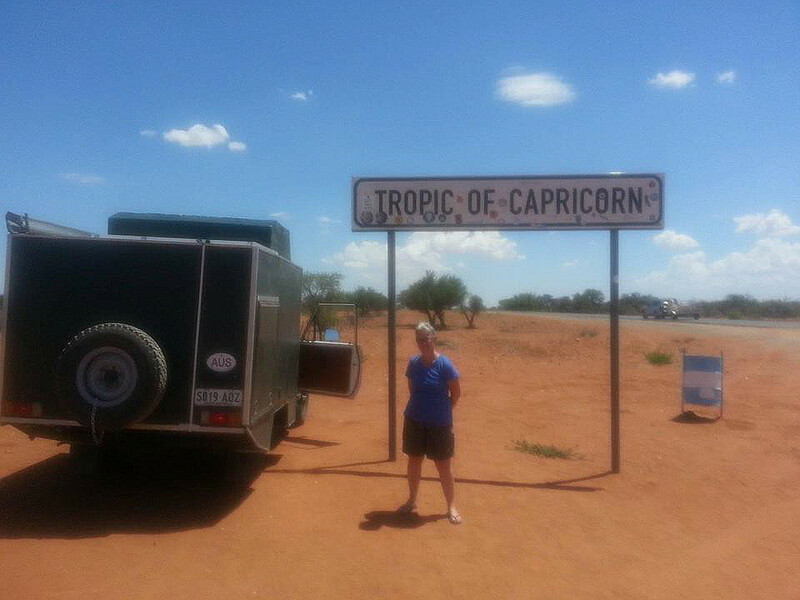 When we reach the northern border, we will have driven the length of Namibia, all on the B1 highway. Some parts south are pretty ordinary – just a narrow strip of bitumen with a line down the middle. 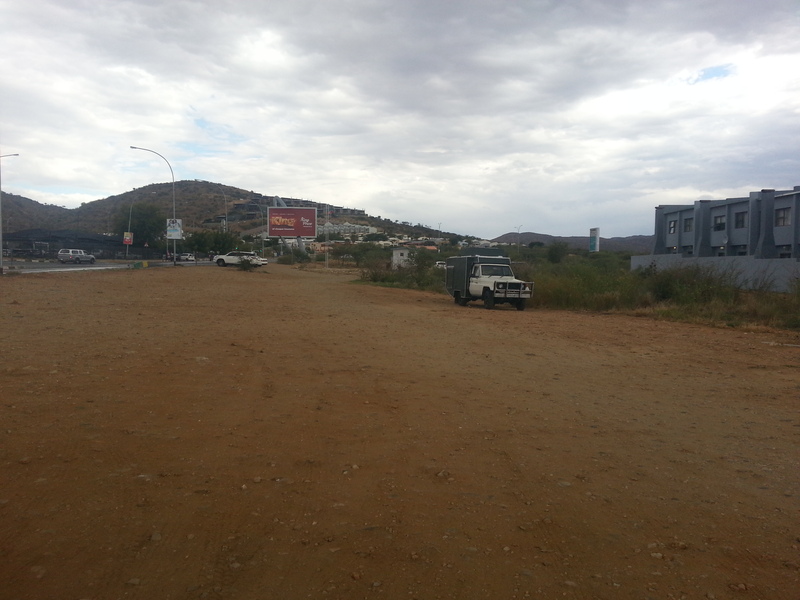 And then there’s the new bit just north of Windhoek – new road, still being built, 2 lanes on either side, lovely. There’s a police checkpoint a few kms north of Windhoek and we were stopped by a young woman wanting to check that we had paid our road tax. We had paid the N$295 AUD$29.50 at the southern border, so we just had to show her the official bit of paper, plus Greg’s passport and driver’s licence and that was all good. Then got down to the reason for stopping us. It’s a friendly, efficient way of getting pleasantries out of the way. 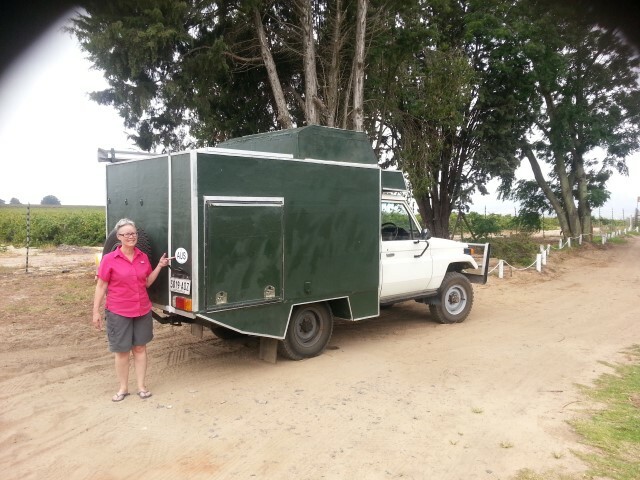 She also had a quick look in Clancy, because he’s interesting both in terms of where’s he’s from – South Australian numberplates, AUS sticker on the back – and what might possibly be behind the side flaps and door. So, our first brush with a Namibian official was fine. 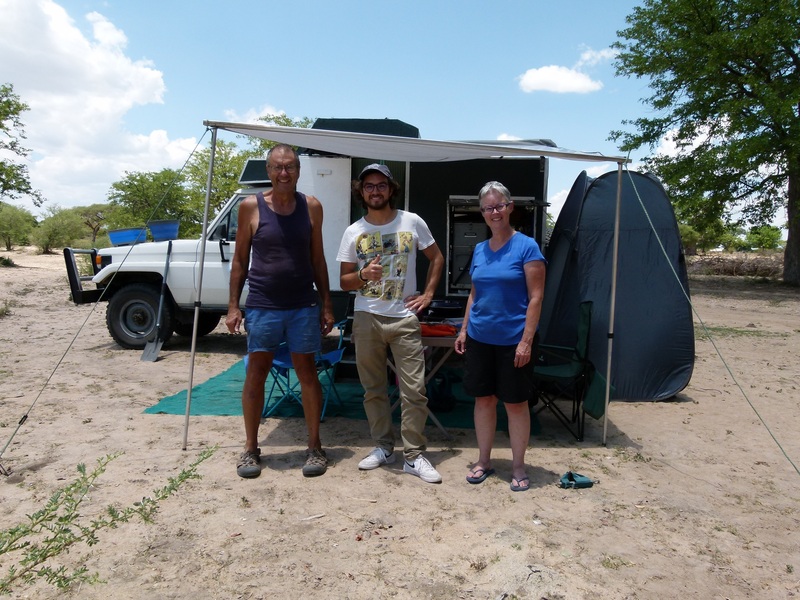 Later in the day we stopped at a SuperSpar in Otjiwarongo, which is near a couple of popular national parks – Waterberg Plateau to the east, and Etosha to the north. A lot of overlanders, travellers, tourists and buses stop there to get fuel, food and whatever else they need. The SuperSpar is big and very well-stocked, including a whole aisle of imported German food in cans, packets and jars. Anna, Henry and any other Germans reading this – it’s worth a visit if you’re missing anything from home. As we were parking, a local man went up to Greg and started talking, asking his name, how it’s spelt, where he’s from, why we’re there. Then another man started the same with me, asking the names of my kids and if I had any grandkids. By the time we had locked the car and camper, the men had carved our names on pieces of stone that they wanted us to buy. Our standard reply to this kind of sales pitch is ‘we aren’t allowed to bring it into our country’, and these days I just don’t buy souvenirs, I don’t need any more stuff. So that went on for a short while, then I found a car guard who happened to be carrying a big stick, asked him to watch Clancy and we went into the retail haven that is SuperSpar. 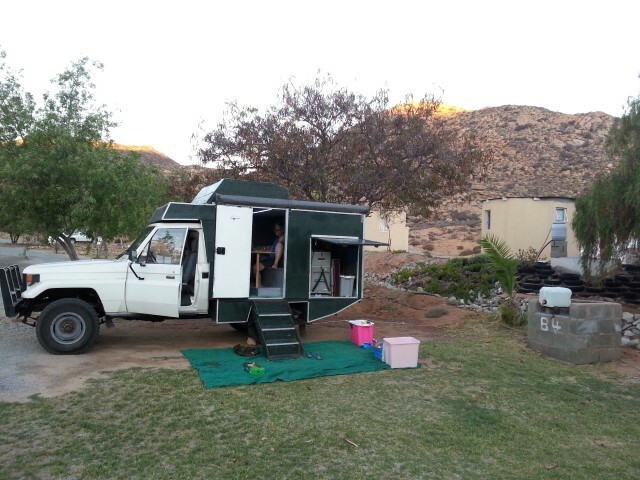 We didn’t buy much, having already stocked up at Food Lover’s in Windhoek – cold drinks, a South African power board, razors for my hairy legs (just checking to see who’s really reading this – ha!). Our stone carvers were still waiting for us when we got back to Clancy, but quickly changed to just asking outright for money ‘for bread to feed their children’. No, sorry guys, we don’t give money to beggars, although if they had just asked me to buy a loaf of bread before we went into the supermarker, I probably would have. 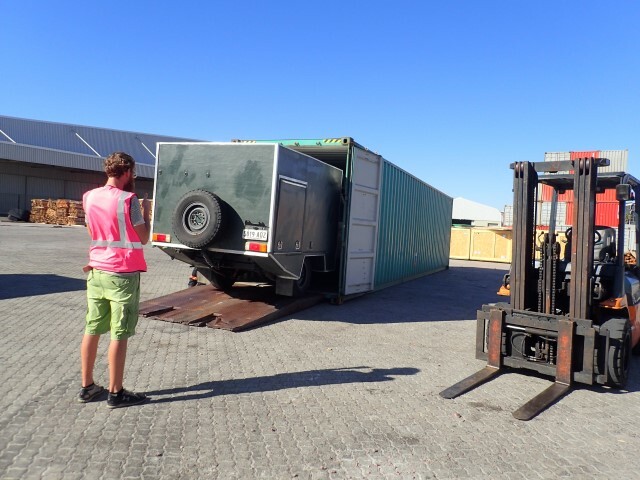 And so … onwards, towards Tsumeb and our final and most interesting encounter of the day. We got about 80kms up the road and were stopped by another police officer. This wasn’t a checkpoint, just a single police car with a couple of cops parked under a tree near an intersection. 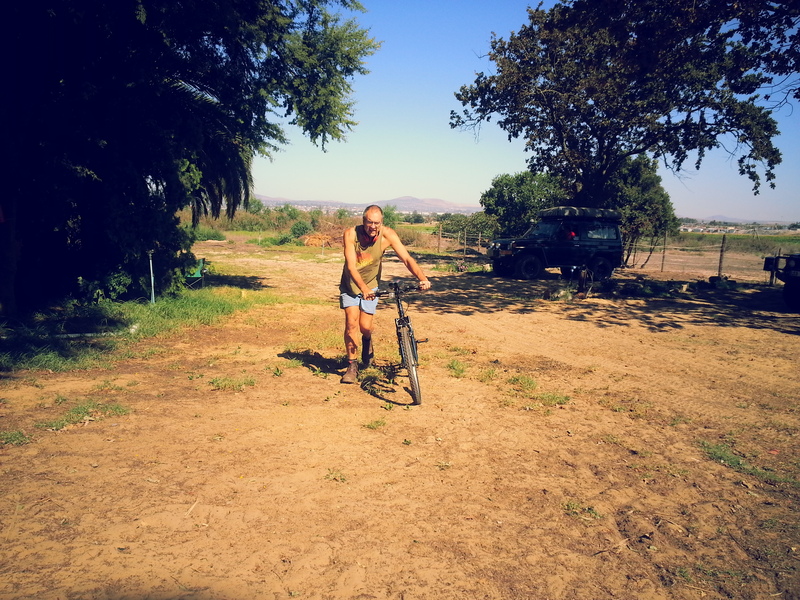 He told Greg that we had been driving 86kms in an 80km zone. The speed limit on the B1 is 120kms, unless otherwise signposted, but this particular short stretch of road is 80kms because a lot of heavy vehicles turn into and out of the intersection. Okay, so we missed the 80km sign, but Clancy doing 86kms on a flat bit of road is extremely unlikely, he just can’t go that fast unless we’re going downhill with a tail wind. Anyway, Greg was very apologetic and contrite. Cop asked for his driver’s licence, but no other paperwork, which seemed odd. 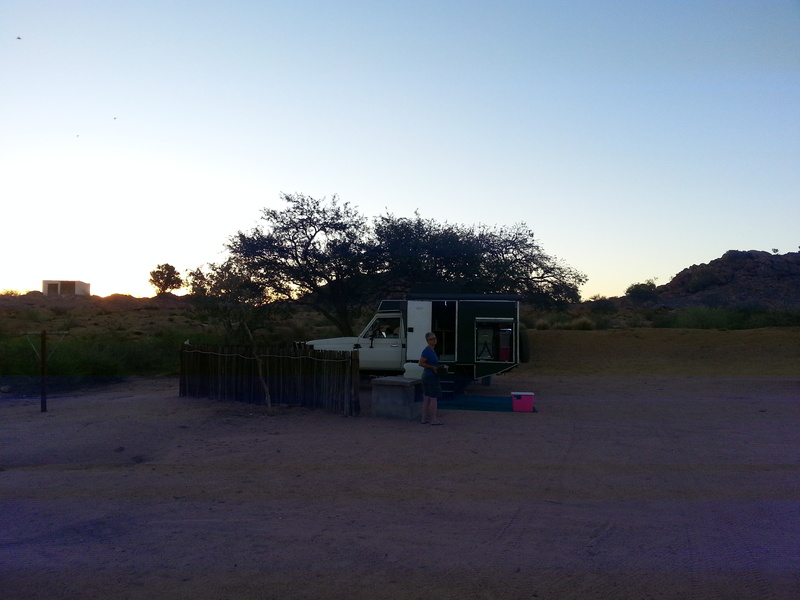 He told us it was a N$400 AUD$40 fine, and that we would have to pay it at the town we had just left, 80kms south. Us: oh gosh, well okay, that’s what we’ll do then. 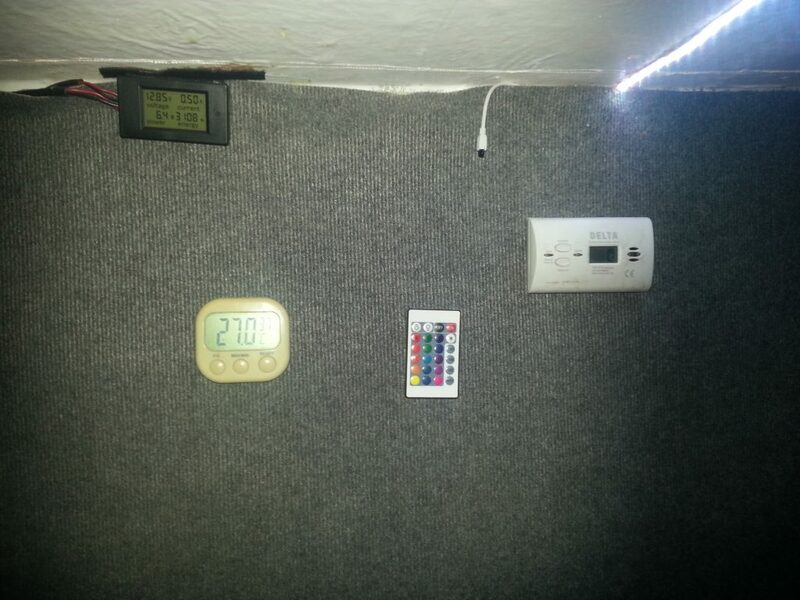 How do we tell the station what we have to pay? Him: Oh, I’ll give you the paperwork, but you have to drive 80kms to pay it because we don’t have a receipt book here. He made a big point of what a hassle it would be for us to drive all that way back. Eventually he gave up waiting for us to just offer to give him the money, and he let us go without paying, so he could move on to some other poor sucker who would cough up on the spot. We didn’t realise while it was happening, but as we were driving away, we figured it was a con. Greg was definitely not driving 86kms/hr, but because we appeared to be prepared to drive back to pay the fine, the scam came undone. A lot of people would have been needing to get to Etosha or wherever they were going before dark and would have just paid … we were intending to get to Tsumeb, but that wasn’t essential, so … sorry sir, we don’t give money to people in uniform just because they ask for it. To anyone reading who might get caught in a similar scam in the future – tell the cop you’ll go with him to his police station so it can all be sorted out. If it’s legit, you’re doing the right thing. If it’s a scam, he’ll back right down and let you go on your way. 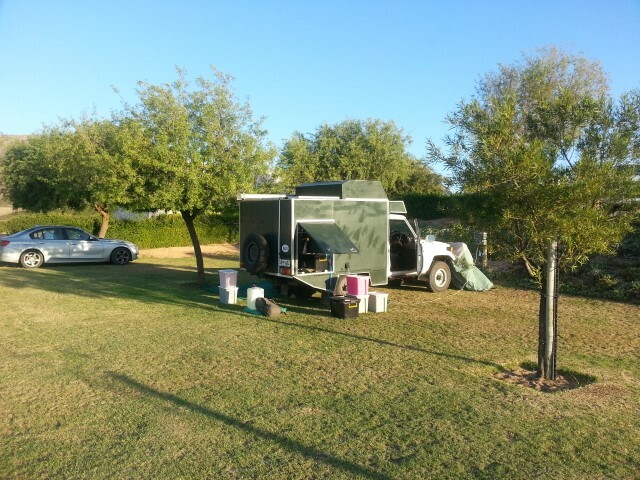 We stayed at a lovely campground just south of the town in Tsumeb, part of the Kupferquelle Resort. Grassy sites, lots of trees, swimming pool and probably heaps of other stuff that we haven’t found. Sounds so much better than figuring stuff out as we go along, right? 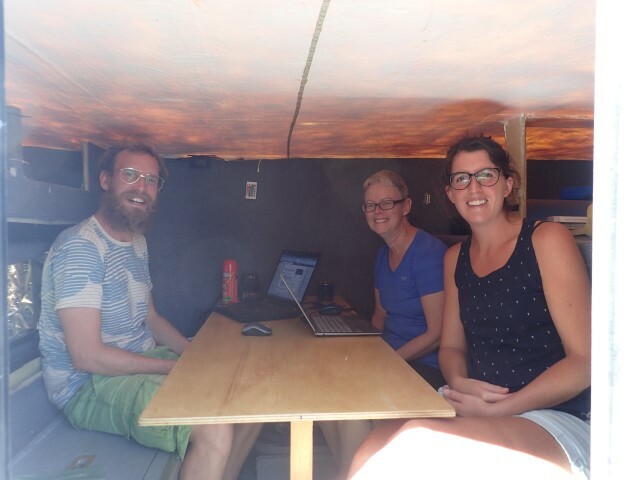 We’re still settling into camper life – adding bits, moving things, tweaking how we do things. It’s all going well, though. Clancy is comfortable to sleep in and fairly sound-proof. 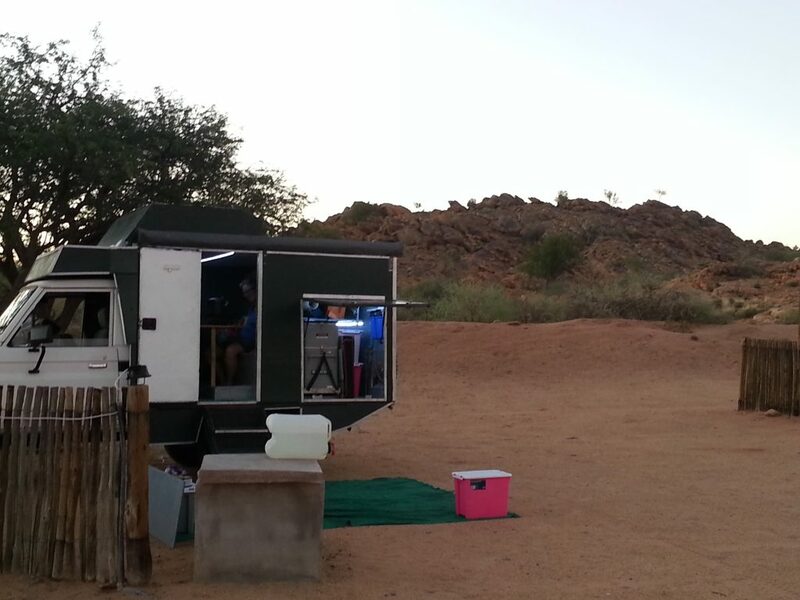 We’re in Windhoek tonight, the capital of Namibia, staying in the campground section of Arebbusch Travel Lodge. We’re close to the airport on one side and a main road on the other, but so far it’s not too noisy. 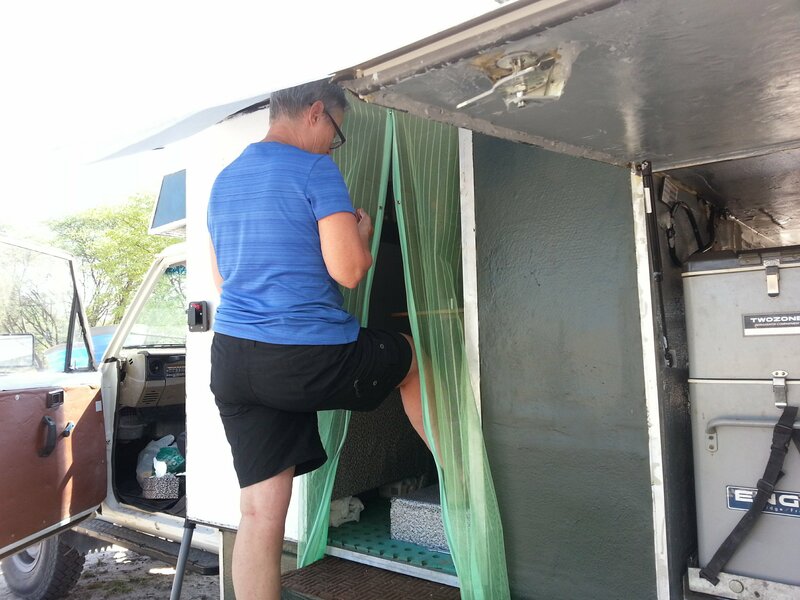 We’re learning stuff too – when we were changing the flat tyre a couple of days ago, I put the wheel nuts on the ground and the threads got all sandy, and needed to be washed thoroughly, otherwise even just one grain of sand would have wrecked the thread. Greg already knew that. Now I do too. Then yesterday we came very close to running out of fuel because we trusted our stupid GPS to tell us where the next servo was … but it had closed down. We must have been running on diesel fumes for the last couple of kms because when we filled up, we put 69.68 litres in the 70 litre fuel tank! The lesson here is to only trust the GPS if our printed map also says there’s a servo. We crossed out of South Africa and into Nambia. The border crossing took about an hour, with many offices visited to get the Carnet processed. 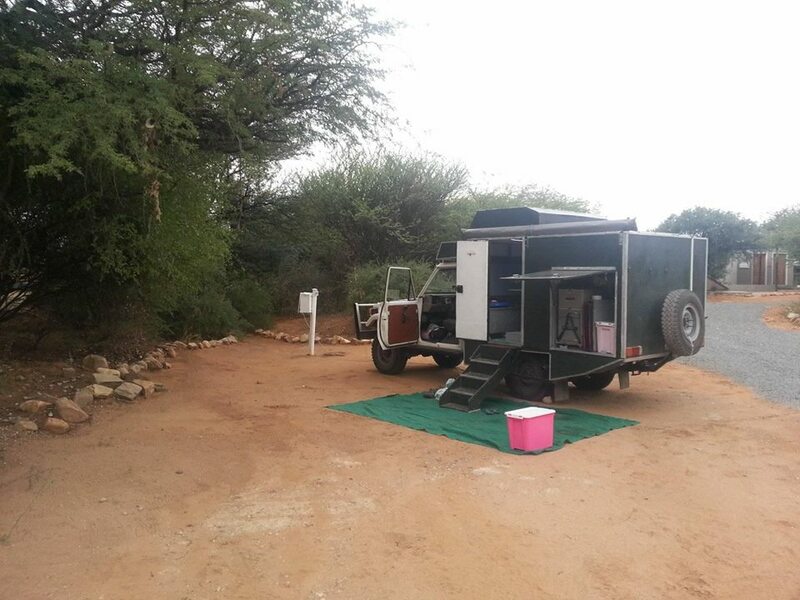 After a puncture in a front tyre only 2km from our destination, we are now camped at “The White House” camping area about 20km north of Grunau, Namibia. 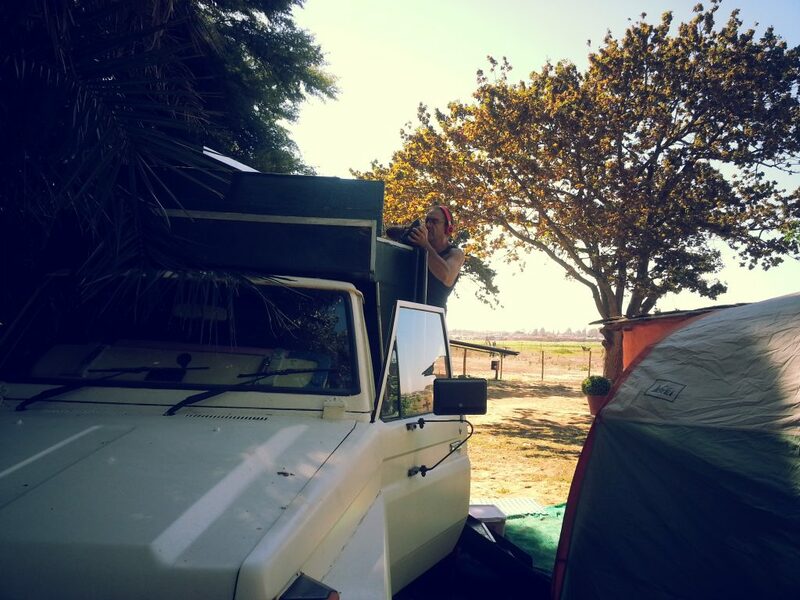 As soon as we got our Clancy, we switched from Airbnb mode to camping mode, so we headed to African Overlanders. 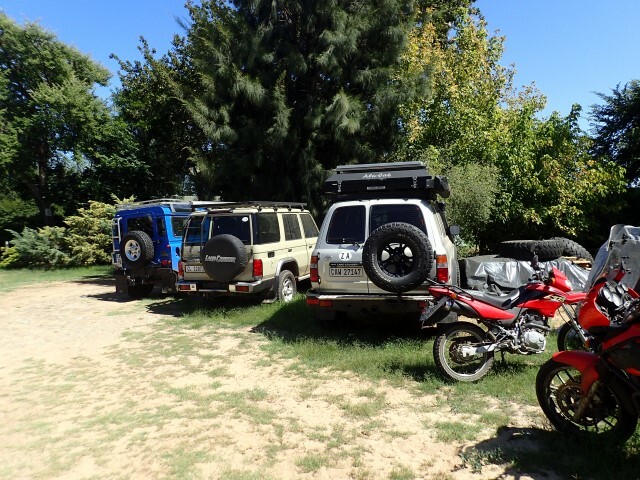 Located on a farm about 30kms north-east of Cape Town (with a great view of Table Mountain to the west and the Hottentots Holland Mountains to the east), and not far from the Airbnbs we stayed at when we first arrived here, it is a haven for Overlanders needing vehicle or motorbike storage, mechanical assistance, advice or a place to stay – either camping in their own vehicle, tent or in one of the straw-bale rooms. 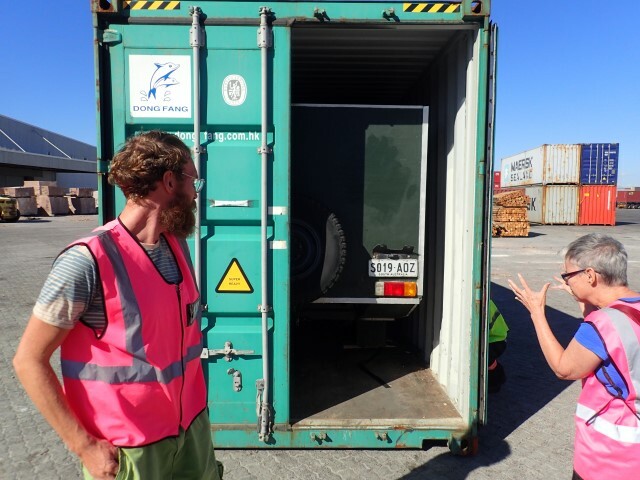 Duncan can also organise shipping. 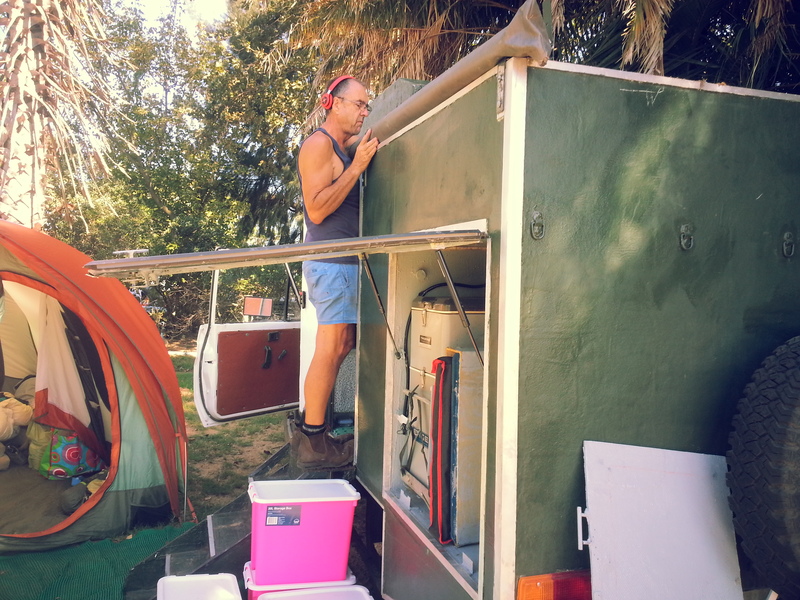 We spent 4 nights there getting organised to head off into the wilderness. 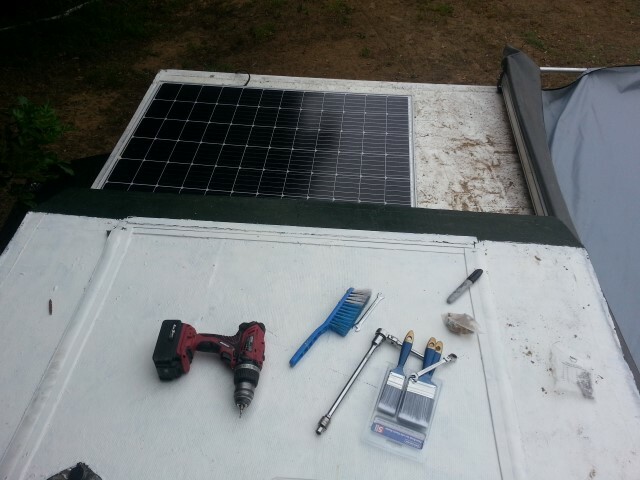 Greg was busy doing big tasks including fibreglassing a storage box onto Clancy’s roof, bolting a solar panel onto the roof, putting his pushbike together and other important things. I kept busy doing little stuff like washing, cooking and moving piles of stuff from one place to another, then somewhere else then back to the original place. Well, that’s how it felt anyway. 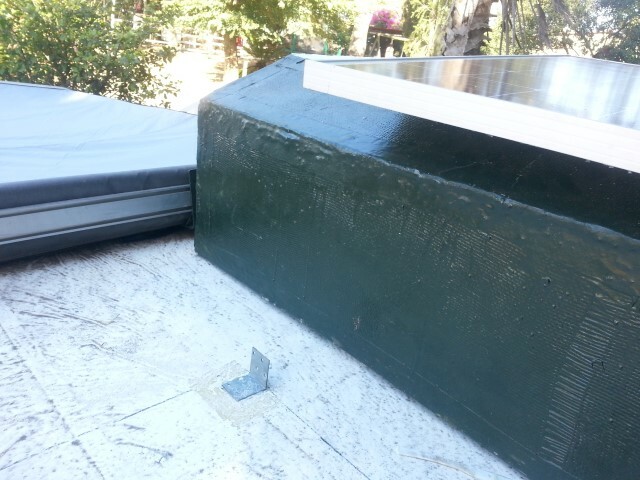 We’re still figuring out where to store stuff, but that’s always a work in progress. 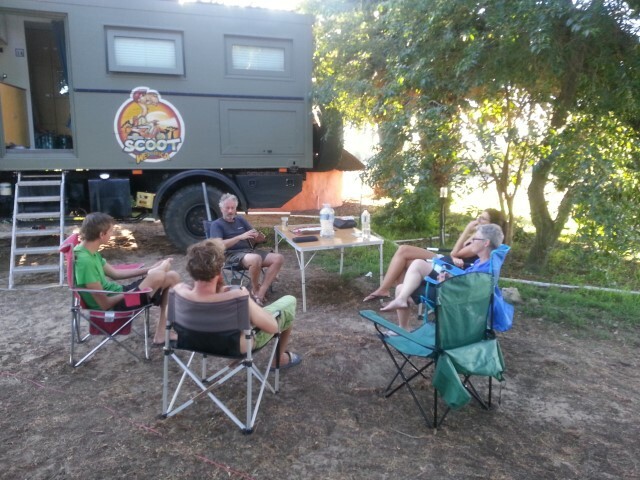 While we were at African Overlanders, we met fellow travellers and exchanged stories. Most had been on the road for a while, travelling from north to south via various routes. It was good to hear their advice, tips and tales. The second night we were there, 8 of us shared a meal – someone had leftover curry sauce and rice from the previous night, I added the chicken sosaties skewers I’d planned to cook for our dinner, someone else had a baguette and salad ingredients and with all that we had heaps of food with seconds for everyone. 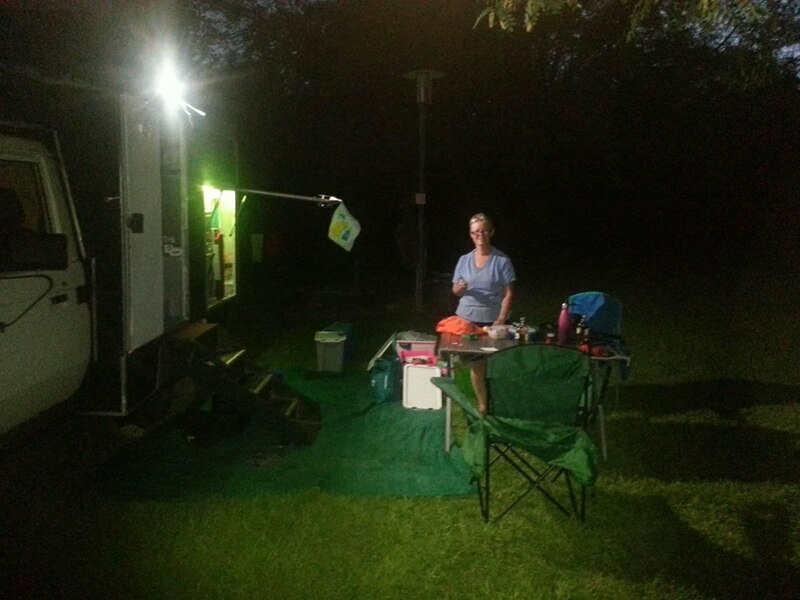 We ate off Meakin English bone china plates, which are part of the very well-equipped camp kitchen that’s located in a 40ft shipping container. 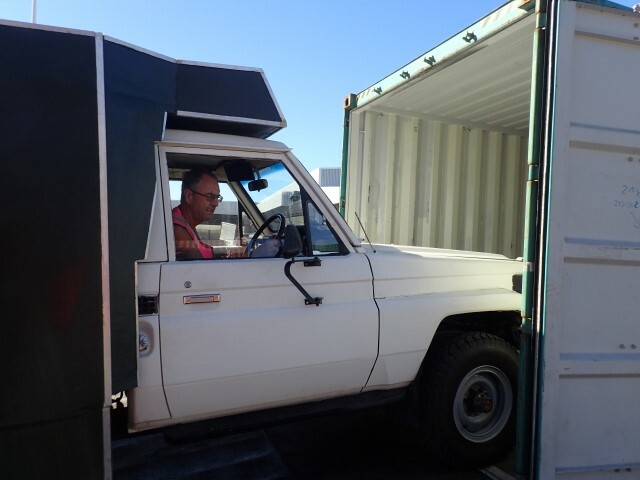 The bathrooms are in a 20ft shipping container. 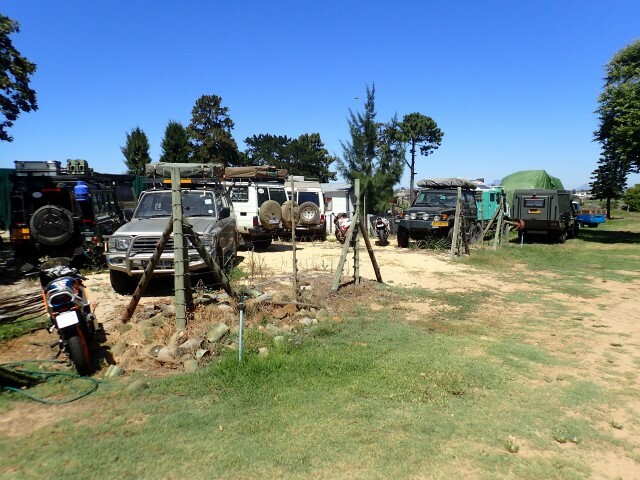 African Overlanders is fairly close to the shopping centres we visited when we were Airbnb-ing, so we went back to familiar places to do our shopping. 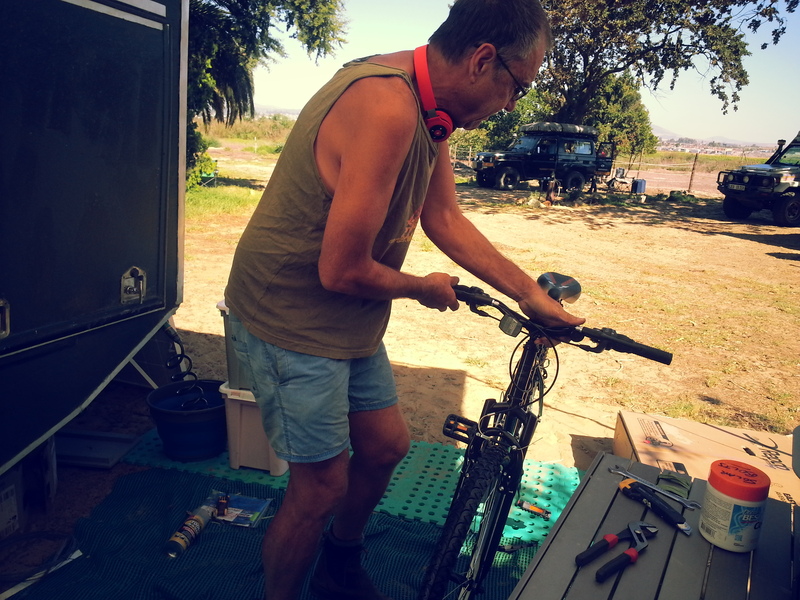 Greg also rode the 5 or 6kms on his bike a few times to go to local shops to get some food and hardware bits, because it was much easier than packing up the camper to drive there. 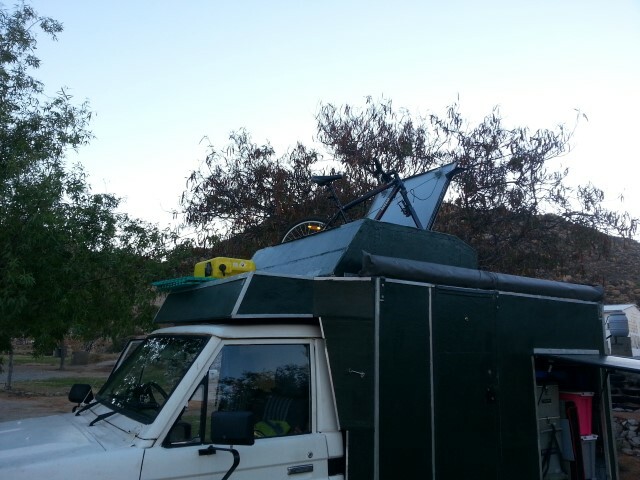 Also, the camper had to stay stationary for 24 hours or so while the fibreglass on the roof dried. So it was handy having the bike for running errands. We said goodbye to Anna and Henry on Friday – they were meeting friends for the weekend. We’ll miss them and will follow their adventures with great interest. As they are planning on spending a year in Africa, I’m sure we’ll get some good ideas from them on where we should travel on our subsequent trips within and around Africa. And then by early Saturday afternoon we were finally organised and packed up to get going. First stop was Food Lovers, our favourite fresh food shop, where we bought lots of new potatoes for Greg and 3 punnets of raspberries at the bargain price of $2.50 for all 3! 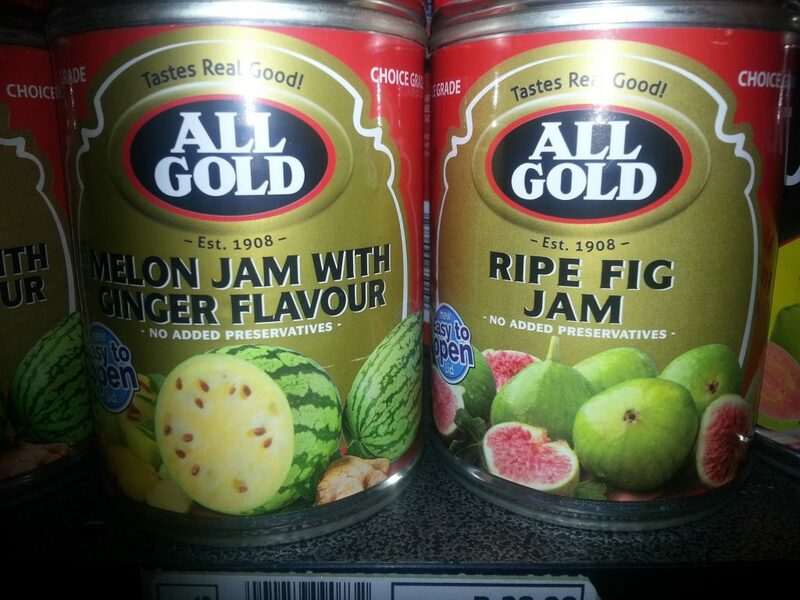 As a comparison, at home I occasionally buy one punnet when raspberries are on special for under AUD$5.00. We bought some other food too. We spent our first ‘proper’ night in Clancy – sleeping in the camper rather than in a tent – at a lovely campground at Kardoesie, grassy sites, lovely views, quiet and not crowded. All went well and we feel like our set-up is working well for us. 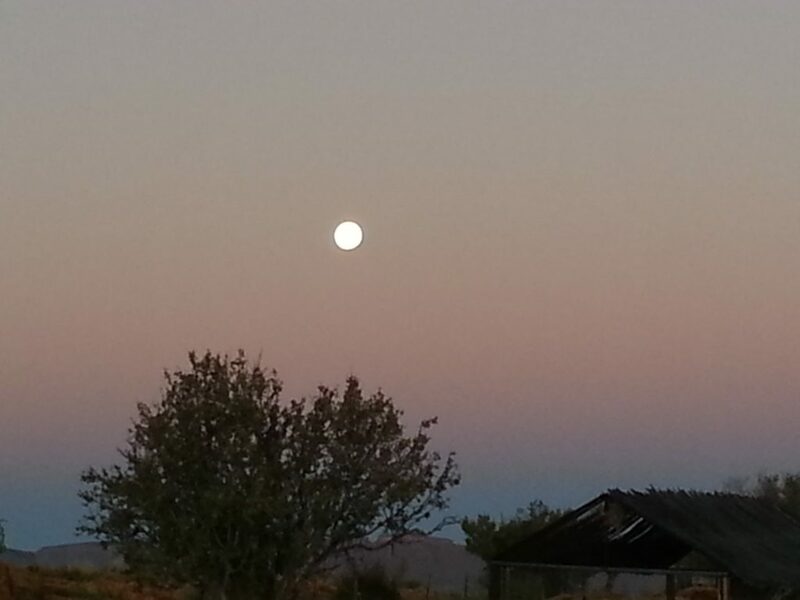 Yesterday, Sunday, we drove further north and stopped at Springbok Caravan Park for the night. Another nice place with grassy sites and a swimming pool. 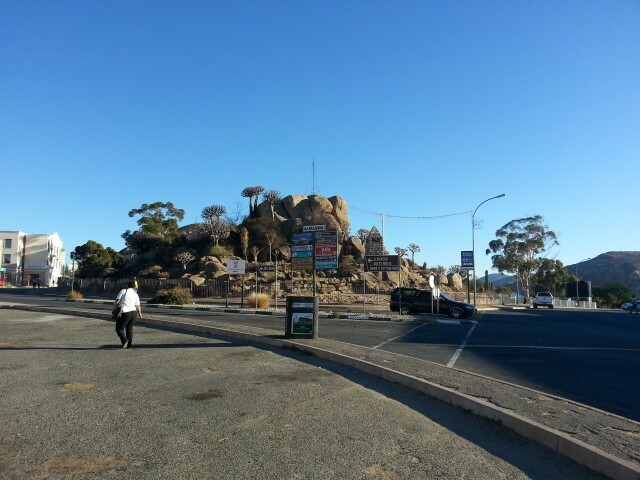 Springbok is very much like Alice Sprince – low mountain range going through the town, very similar terrain and even some hills in the middle of town, like Anzac Hill in Alice. 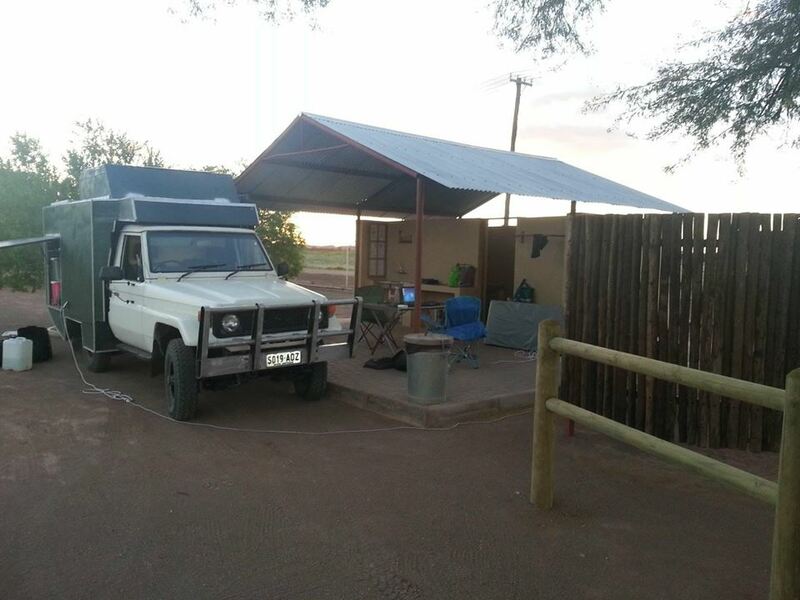 The Namibian border is only about 100kms north of here, so today will be our first border crossing in our own vehicle, and we’ll get to use our Carnet for the first time.